As featured on "No Frontiers" 2003 & 2010. 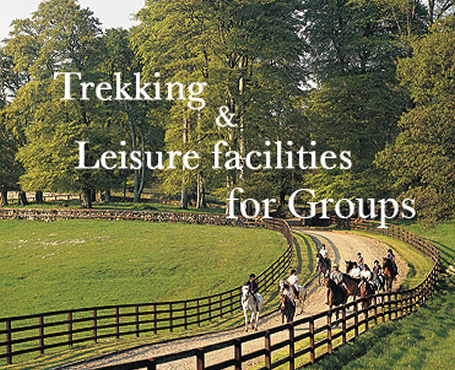 With its wide open spaces and breath-taking scenery, Ravensdale Lodge Equestrian, Trekking and Event Centre Co Louth offers a truly magical setting for trekking and leisure pursuits. The horse riding centre is located near Ravensdale Forest Park, recipient of the National Forestry Award, and is nestled into the scenic Cooley Mountains that sweep down to the medieval town of Carlingford on the banks of Carlingford Lough. Ride away from an hour to a day! Let our team of safe, reliable Irish ponies, cobs & horses guide you on a fun trek out with friends or family into the forest or for the more experienced, take the challenge of a memorable full day in the saddle to Carlingford, an unforgetable horse riding experience. Ideal for all groups, Hen Parties, Family treks, Corporate days out, Team building, Riding / Pony clubs or just a relaxing way to spend time with the people you love. There are options to cater for all levels (from beginner to advanced) so whether its a leisurely introduction or a more ground covering hack we can tailor to your needs. We have unlimited trekking / hacking trails in both forest and mountain terrain with breath taking scenery, so for a unique horse riding holiday experience let Ravensdale Lodge be your guide. Our treks have featured on travel programmes such as "No Frontiers" (2003 & 2010) and in many National and International press publications. Various horse trekking routes include 1hour, 1 and a half hour, 2hour, 3 hour treks, full day or overnight trail rides with gourmet picnic hamper. We will advise you on the best options available for you or your group when you contact Ravensdale Lodg. National Enterprise Award Winners For Industry Excellence 1997, 2002 & 2007. Nominated for "Show of the year" 2009 & 2010. Featured on "No Frontiers" 2003 & 2010.